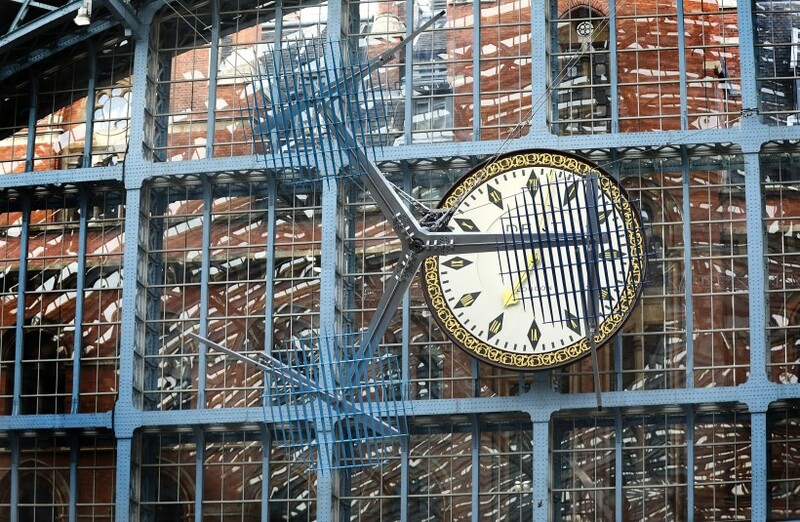 Unveiled by the Royal Academy of Arts and St Pancras International the major site-specific installation, The Interpretation of Movement (a 9:8 in blue), 2017, is Conrad Shawcross’s most ambitious mechanical work to date, stretching out to a 16m diameter as it methodically turns above the station concourse. Consisting of three articulated arms driven by a complex sequence of gears, the mechanism drives three ‘optic sails’ which expand and contract in an orbit from the centre, at which point they eclipse each other where they form a complex pattern of interference. The work is commissioned for Terrace Wires, the station’s public commissioning programme for new artwork by leading international artists. This is the third instalment of a four-year partnership between HS1 Ltd. (owners of St Pancras International) and the Royal Academy for the station’s public sculpture series.